You all know I live in Minnesota with my daughter and a gaggle of pets. I feel like I am forever cleaning and I frequently question if things are really clean. I’m the type of mom that carries wipes with me everywhere so I can clean down tables and countertops when we are out and about. And I always have a bottle of hand sanitizer with us just in case there is nowhere to wash our hands. 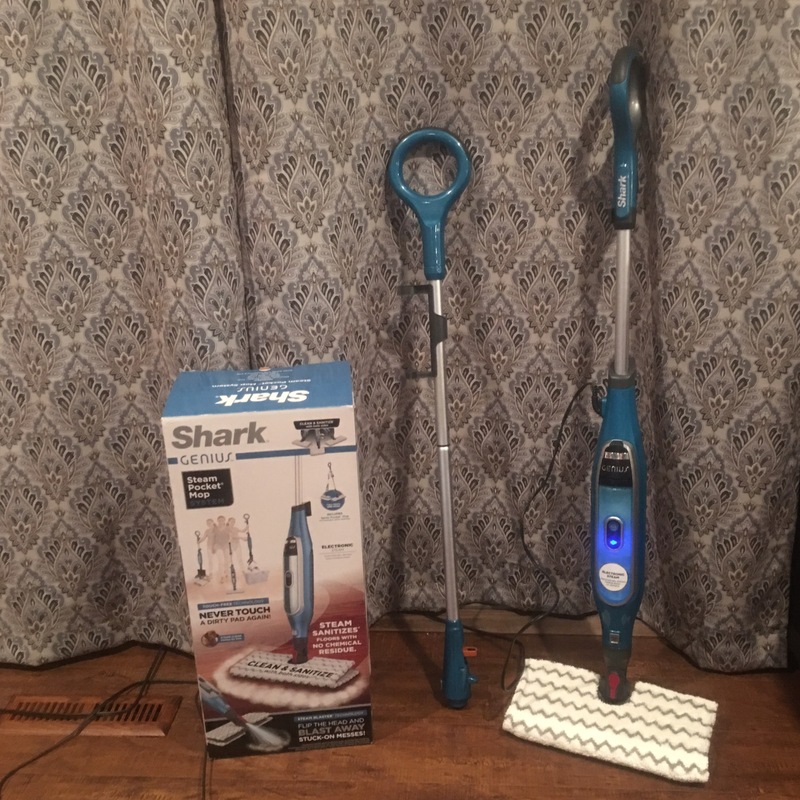 When I saw Shark has a steam mop that not only cleans but sanitizes the floor I became super excited. My biggest pet peeve when cleaning is that many cleaning products leave behind a residue. Especially floor cleaners. Peyton and I went on a trip and had a house sitter. Well, our house sitter did not do a very good job tending to our pets needs. Needless to say, the pets expressed their dissatisfaction, all over my floors. Our sitter tried to clean up and used a floor cleaner to mop up the mess. But all I saw when we came home was a streaky floor and the house smelled like a citrus grove. So while the cleaner tried to fool my senses that the floors were clean I could immediately see they were not. 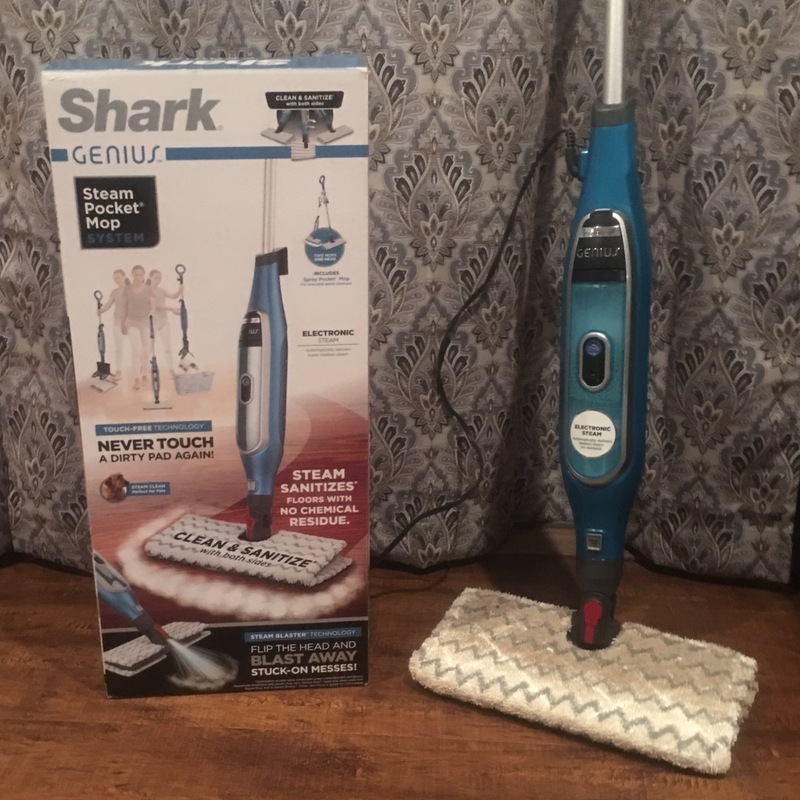 I took out the Shark Genius Steam Pocket Mop System and put it to work. First off, it’s super simple to put together! No tools required and it took less than 5 minutes. It even comes with a little pitcher to pour water into the steam reservoir. Shark thought of everything with this mop. And it only takes 30 seconds to heat up! I was cleaning within minutes of taking the Steam Pocket Mop out of the box. I really want to do a deep clean and disinfect the floor. Peyton plays with her toys on the floor so the thought of her playing on the floors when I could clearly see and feel a residue grossed me out. All I could think about was bacteria and germs and ick! To disinfect you need to go over the spot 15 times with the steam mop. That will give you a deep clean. You don’t need to do this every time you are cleaning but since I wanted to make sure we had clean floors I went over every inch of my floor 15 times. It was a process to clean my floors but they look amazing! And when you look at how much dirt and grime came up with the steam mop it makes it hard to believe our house sitter ever washed the floor. I also love that I can change the mop head without ever touching the dirty mop! There’s a little button you press on the back and it releases the pad. Then you toss the dirty pad into the washer. The floor only took a few minutes to dry after I steam mopped it, I was able to walk on it within 10 minutes of finishing the task. Plus, there is no sticky residue or film on my floors. They look shiny and clean! Now I have no concerns about letting Peyton play on the floor. With winter, I am sure I will be using the steam mop to help keep my floors clean and germ-free. You can find the Shark Genius Steam Pocket Mop online or at your local retailer.